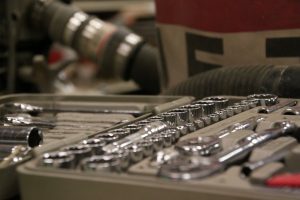 Renfrow’s is an old-fashioned full-service hardware store specializing in many traditional hardware supplies – fasteners of various types, hand tools, plumbing parts, appliance parts, and more. We stock many hard-to-find items and our team has a wealth of knowledge about all of them. Let our guys work with you as you solve your household handyman projects and problems! 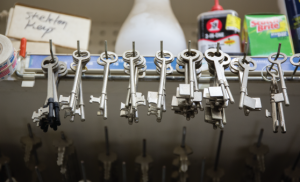 We stock over 1000 varieties of key blanks, which is likely the largest selection of standard and oddball keys in our region. Ninety-five percent of them are manufactured in Rocky Mount , N.C. by Kaba Ilco Corp. Ilco recycles metal waste from the local air force base to create many of these key blanks. Ask other stores which foreign country their keys come from! We use manual machines, not automated ones, for quality control and to ensure that you will leave with your keys cut correctly. We also cut many of the high-tech auto keys at a significantly lower rate than the car dealerships. 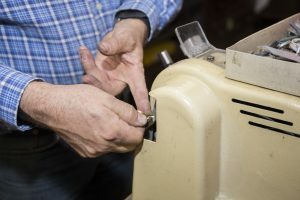 We are unable to cut sidewinder or laser-cut keys. 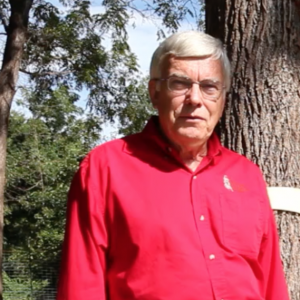 Ted Caudle, fondly known around Charlotte as The Plant Doctor, hangs out at Renfrow’s on Saturdays from 10am-2pm. He made his career as a NC Co-Operative Extension Agent in Mecklengburg County and hosted a local radio show about gardening for many years. Come visit Ted and soak up his knowledge. Bring samples and photos of diseased and/or troubled plants and he will help you solve your problems. He is also very good at demystifying your soil sample results and helping you plan a weed-free lawn care regimen. On Tuesdays when the hardware store is closed, we work in our store shop. Dennis sharpens knives (non-serrated), lawnmower blades, and chainsaw blades each week. We also replace and repair tool handles. Drop your items off anytime before we close on Saturday at 2pm and your items will be ready the following Wednesday when we open at 8am. We cut glass any day of the week if you provide the exact dimensions necessary, or bring in the frame it needs to fit. Mark spends his Tuesdays re-screening old windows, or creating new ones, that customers drop off the week beforehand. Like with the knives, repaired screens are ready for pick-up the Wednesday following drop-off.